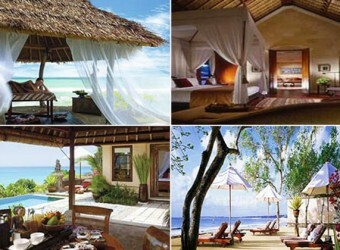 Bali Hotel It is the great quality of high-class resort, Four Seasons Jimbaran. It has beautiful green Balinese courtyard, and guests can enjoy great view of emerald green Jimbaran Bay. All rooms are suite type. Bedroom, bathroom and living room is separated to keep privacy. They offer great service with hospitality to create your holiday gorgeously.